COBRA contains all the information you need to turn your idea into a business. Log on and find more than 4,000 factsheets, market reports, contacts and sources of funding and support plus hundreds of practical guides to starting up more than 350 types of business. 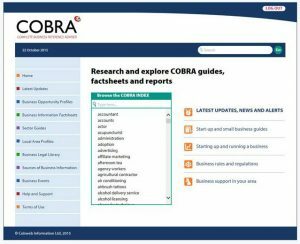 If your library is a member of Ask About Business you can access all areas of COBRA right now. Simply click HERE and log in with your library ticket. If you have a library card for any of the Ask About Business member libraries, then enter your library card number. Ideal for anyone looking to start a business, write a business or marketing plan or conduct research into a new market. COBRA is also available at any Ask About Business library with internet PCs. Please note the Terms & Conditions of using this service. Find out about some of the ways to raise finance for your new business. Hear how our panel built their businesses around bold ideas using digital innovation to transform our daily lives. Can you make money making music? This panel event will give you the chance to hear from musicians and music technology experts. If you’re planning a new business in 2019, COBRA can get you on the right track! The closing date for NW entries is Friday 7th December! This webinar from UK2 will show you the 5 building blocks for creating a successful online venture. I came away with a bounce in my step. me in the right direction to hopefully assist in my future success.